St. Brendan and his crew celebrating Easter on the back of a whale. In this week’s extract Beowulf fends off more of those sea-borne fiends. So Beowulf here takes a little opportunity to explain more of his exploits when fighting feral beasts. Of course, you kind of have to admire the guy. He’s here, supposedly just explaining what really happened with the whole swimming contest thing, but he manages to work in some boasts about his battle skill nonetheless. Plus, what he describes is a battle with an enemy that’s just as ill-defined as Grendel is, too. No doubt that’s meant to give the Danes further hope in spite of Unferth’s attempt to chop Beowulf down. Maybe, as unlikeable as Unferth is in my mind, that’s kind of why he speaks up. Or rather, that’s why Hrothgar let him speak up. He knows that Unferth, as cowardly as he is, will call Beowulf out and if this Geat is as worthy of the challenge of Grendel as he himself claims to be, then he’ll be able to repel Unferth’s accusations. Since he’s shown himself a master of rhetoric, it’s possible that if Unferth’s speech is part of some test of Hrothgar’s that he was also hoping that this young warrior newly come into his hall will prove his ability with words as well as with swords. I’d say Beowulf does that with some success here. He might not be as eloquent as Hrothgar, or, of course, as the poet behind all of this, but Beowulf does become poetic when he’s talking of what he excels in: Battle. The marauding sea beasts would have “served [him] up” (“þæt hie me þegon”(l.563)), and the beasts aren’t just killed, they’re “set to the sleep of the sword” (“sweordum aswefede”(l.567)). Plus, having been a boaster since he was a child Beowulf not only takes this opportunity to boast about how he spent a night defeating sea beasts (a skill that the Danes no doubt hope will transfer to land), but also goes one step further. In this part of his version of the story Beowulf makes the self-aggrandizing claim that because of his handiwork the sailors in the area no longer have to worry about being harassed by these beasts. This statement brings up some questions. Is Beowulf trying to imply that he killed all of the region’s sea beasts or simply that he scared them off? 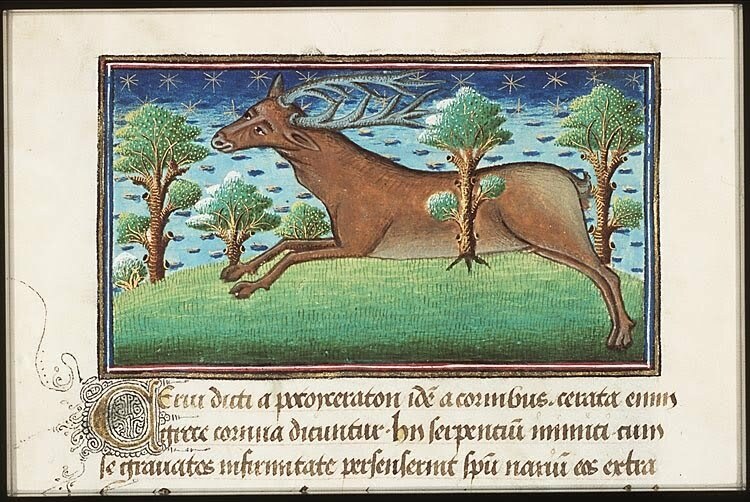 Was this part of the sea famous for being overrun with “whales” or whatever “sea deer” are/were? Or was it a little known place that anyone could say anything about and not really be called out on? Answering the first pair of questions is tricky, at best. Left at just an implication, though, Beowulf’s saying that after his night of fighting “none/near the steep ford the seafarers’/course could hinder” sounds almost equal parts true and untrue. Which brings us to the second pair of questions. If this place was famous for monsters, then surely someone would pipe up with a contradiction or agreement. Though, Beowulf did do all of this fighting when he was a few years younger, so, as long as the area didn’t fall back into the fins of the sea-deer, I guess there’d be no real objections to his story. And that makes it all the more ingenious. Maybe around the time that he did this the beasts actually did start to grow scarce, but not because of him. Perhaps they moved because they needed to find a better food source. Or they left the area in search of a place where boastful swimming contestants wouldn’t harass them so violently. The same thing can be said if the area Beowulf’s story is set in is little known. These events’ happening a few years before his appearance in Heorot would simply make it all the more difficult to prove or disprove his story. So, as much as Beowulf may be a brute when it comes to matters of sentence-level rhetoric, jamming his ideas into whatever constructions he has, it seems like he really does know his way around a boast. However, whether or not that’s because he’s made many successful boasts or just has a stick-to-it attitude when it comes to fulfilling his boasts has yet to be seen. Do you think Beowulf killed all of the area’s sea beasts or that he merely put the fear of human kind into those that remained? Past weeks have left us with little to note in the way of weird words. This week, that changes. These first two words paint vivid pictures of their subjects through their combinations. The word “yð-laf” means “shore” or “beach.” But it’s actually a combination of the word for “wave” or “sea” and a word for “leavings,” “relic,” or “remnant.” That the sea’s leavings are the beach makes some sort of sense. The constant motion of the waves over it could stir that sort of idea in an observer. Under close scrutiny, the waves might start to look like they were leaving the sand behind as they pulled away. It’s a rather poetic image that sheds some light on the Anglo-Saxon worldview. Though, whether that particular aspect of their worldview is that the water is greater than the land or that the earth is the remains of some sort of long gone water being or simply that all things leave something behind when they depart is unclear. There’s something locked in the poetry of that image. Similarly, though more straightforwardly, this week’s extract brings us the word “brim-liðende.” This word combines “brim” for “surf,” “flood,” “wave,” “sea,” or “ocean,” with “to go,” “travel,” or “sail” to give us a word for “sailor.” It’s neat and quite tidy, and is simply a more descriptive way of identifying someone who travels by sea. This week’s third word isn’t quite so straightforward. Now, the real star of this week’s word watch. It’s a strange one primarily because it’s unclear. What it means as a whole is well-defined enough. But with my dictionaries and limited knowledge of Old English word formation I wasn’t able to come up with exactly what its parts mean. The word “fordædlan,” though, is tougher to define. My first instinct was to look up “fordæd,” thinking that the last three letters are probably a suffix of some kind. But that turned up nothing. Next came the even shorter “dæd” meaning “deed, action, transaction, event.” If we take this word as the root of “fordædlan” and combine it with “man” its translating as “evil doers” makes sense. The doubling of the sense of act or deed could be a way of emphasizing just how evil the thing the word refers to is. The thing itself is an evil deed, an act of malice, an enacted expression of wickedness that, of course, begets its own wickednesses. Hence, the “evil doers” of line 563. What do you think “fordædlan” of “man-fordædlan” means on its own? Could “man-fordædlan” be a compound that’s so old that its second half no longer stood on its own when Beowulf was written down? Next week Beowulf brings us into the next day and tells of what he saw in the morning light. Beowulf relates his struggle with one of the sea-beasts. Beowulf goes on about his wondrous deeds here. And he includes a great deal of detail about how his armour saved him. Actually, there seems to be a lot of emphasis on armour in Beowulf’s speeches. Well, it’s not like that’s all that he talks of, but it does seem kind of strange how often he mentions armour. In this extract, he spends just over three lines on it, and earlier, when speaking to Hrothgar he instructs him to send Hygelac his armour as a memento if he should die. On the one hand, this armour focus could be ascribed to Beowulf and Beowulf alone. In that case, I’d say that it shows just how aware of the machinations of combat Beowulf is. He may know well the importance of the war rush, or having your opponent’s within reach of sword point, but more than that he realizes the importance of a good coat of mail. Because sometimes you just can’t be sure. If, on the other hand, this emphasis on armour is the poet’s doing (rather than just characterization), then it says something about the Anglo-Saxons. Actually, it says just about the same thing, really. Though I’d add that if it is a general thing, then maybe armour has a special importance to memory. Perhaps it’s sort of how things might be in a particularly sentimental cicada’s brain: its shell, as the armour of its youth, holds within it all of the memories that it made while wearing it. Likewise, just as a sword was regarded as imbued with special power if it’d been wielded by a male relative or great hero, a person’s armour could hold a memorial significance. Or, more specifically, maybe these mentions of armour are part of a lost mnemonic, some sort of arcane technique for remembering not only heroes (as Beowulf would be remembered by his armour when it got to Hygelac in the event of his death), but their stories as well. It could be that the armour, after enduring with its wearer the great feat of facing Grendel (or the crash of the ocean waves), becomes a metonymy for its wearer. Not just in a metaphorical sense, but in the same sense as the shed carapace to the sentimental beetle, that armour becomes a shed part of that hero, that fighter. Practically, speaking though, swimming in a mail shirt makes Beowulf’s bet with Breca all the wilder. Those rings wouldn’t be made of fancy ultralight bicycle aluminium, they’d likely be made of iron. Swimming can get difficult if you’re weighed down by a particularly thick, wet shirt. It’s hard to imagine the struggle that both of them would endure wearing that sort of armour to sea. Though it’s quite easy to imagine that weight working against Beowulf as the sea-beast he encounters in this passage drags him down. But then, in his retelling the instance, he puts on the armour of the storyteller, shielding his tale in words reserved for warfare. Well, no doubt by something between the Christian god and the Anglo-Saxon idea of “wyrd,” a kind of fate. Invoking such a force, even indirectly, really shows how hard Beowulf was struggling because it places the battle on a cosmic level. This wasn’t just a wee brawl, it was a struggle that the cosmos had a hand in! What do you think of the idea of a warrior’s armour being a container for the memory of his experiences while wearing it? Or of a warrior’s armour becoming metonymous for the warrior? Tee word “mere-deor” (l.558) literally translates into that. And it creates a very simple image: A fish with horns, possibly a narwhal. Why exactly Beowulf would be fending off a narwhal isn’t clear, but that’s clearly not the point of his story. What it’s all about is his strength in overcoming the power of nature. And what a terrible power that is. In line 553 we’re told that Beowulf was being drug down to the “grunde.” Since he’s in the sea, this word generally gets translated as “bottom.” In fact, both Heaney and Gummere use this translation. But “grunde” could also mean “foundation,” “abyss,” “hell.” These words might not be as accurate as “bottom,” but they all have a much deeper connotation to them; “abyss” and “hell” coming neatly packaged with implications of damnation and the impossibility of escape. Given what Beowulf has to go through when he fights Grendel’s mother, this perception and conception of the bottom of the sea becomes very curious indeed. Just as curious as some of this week’s compounds. Well, to be completely honest, it’s hard to say. It’s possible that the use of all of these clear, literally translatable compound words is just due to Anglo-Saxon’s being short on words for these things that were more obscure or poetic. Or maybe they’re the best choices for each line’s alliteration (they are). But both of those possibilities wouldn’t really shed much light on Beowulf and his dramatic retelling of his adventure on the seas. As such, I like to think that Beowulf is shifting his energies from using obscure words and forms to shaping his sentences to reflect the action he’s describing. What then, does the straightforward and literally translatable, but still odd “mere-deor” mean (outside of being alliteratively convenient)? Well, I think it, and the compounds with “hrone” and “fixas” from last week, are present in Anglo-Saxon because the sea was regarded as a mysterious place. Who knows what goes on in there, right? The Anglo-Saxons sailed it regularly, too, and so probably had a sort of reverent fear for things like the tides and the speed at which storms could come upon those ships that were unwary. As such, they probably had only words for the things that they saw most often. Whales and fish definitely fit this bill because both are prevalent along the Northern coasts of Europe, as deer are on the land there. But some sort of strange creature that was a tusked or horned thing in the sea was probably a rare sight indeed, and so to express the idea of that creature the Anglo-Saxons just took two of their existing words and ideas and mashed them together. Adding, in a way, to that creature’s mystery. Do you think that the animal referred to as a “mere-deor” is just a narwhal, or could it be something rarer? Next week Beowulf continues his tale with an account of the rest of the night and the next morning. Beowulf tells a more detailed version of his swimming contest with Breca. the swifter on the swell, I would not float from him. In this part of Beowulf’s version of the swimming contest story, we see a return to an old form. Once more Beowulf is setting descriptions within his narrative, dropping short descriptive phrases between points of action. And he’s doing it an awful lot. So much so that I can’t help but wonder if the poet is deliberately having Beowulf chew the scenery. Or maybe this is just what Beowulf, brash and bold, is like when he tells a story. Perhaps working through each of his little description digressions will help shed some light on what exactly is going on. The first one comes in line 540: “hardiness in hand” (“heard on handa”). In reference to the swords that they held in their hands as they swam, this line seems like it’s mostly a space-filler. It reiterates that the swords they held to guard themselves are hard, and therefore useful weapons. Not to mention, within the alliterative scheme of the line, the original Old English alliterates entirely with itself. This alliterative scheme separates the first half of line 540 from the second, which in turn suggests the semi-colon that divides the line in Heaney’s text, and the comma that does something similar in the text found on the McMaster University site I link to beneath the extract. So would Beowulf the speaker run one of his sentiments into another line like this, overflowing his expression in such a way? I mean it is the beginning of the passage, and it’s not unlikely that he’d feel impassioned as he told of yet more of his wondrous feats. So, maybe in putting this half line here and having it link directly with the previous one the poet is showing Beowulf’s near loss of control over his own story and his own boasting. Or, maybe at this point Beowulf’s starting to feel all that ale he’s no doubt been drinking. The next among Beowulf’s additional phrases is line 543’s “the swifter on the swell” (“hraþor on holme”). Definitely Beowulf’s way of making sure that everyone knows that he’s the stronger swimmer between he and Breca, this half line fits perfectly with its surroundings. It doesn’t seem to be overflow or anything like that. So what’s it mean for it to be compartmentalized like it is? I think, if anything, because this statement is a boast. Beowulf’s been boasting since he was a child, he knows his way around such things and is able to smoothly fit it into his description of their swimming. It almost naturally flows with what’s around it, too. It’s sort of difficult to pin down the next extraneous descriptive phrase, because after line 543 they all become necessary. Beowulf’s description of his and Breca’s “wading on the raging waves,” how the atmosphere shifted to “the coldest of weather,” how “the night darkened” and the storm winds picked up around them, all feed into each other. This part of the extract practically imitates the storm it describes. The shuffling of four distinct and independent half-lines simulates the way in which everything around Beowulf and Breca at this point came crashing into them. This analysis runs a bit short of something you’d find in an academic journal, but I think the main thing to take away from it is that Beowulf, for all his prowess on the battle field, is not so great in front of a crowd. He’s only truly comfortable speaking about the battles in which he fares so well. We can see this as his interjections move from the strangely extraneous feeling, through to a boast, and ending with a series of short clauses that themselves descriptively crash against themselves. But that’s in next week’s extract. What do you think of Beowulf’s speechifying? Is this part of his reply to Unferth perfectly smooth or is it as craggy as I seem to think? In either case, what do you make of it? Okay everyone. There are, as always, more words than one that are notable for one weirdness or another in this week’s passage. The first of these combines the word for “whale” and for “fish” to make the word “whale.” Seamus Heaney translates the instance of “hron-fixas” on line 540 as “whale-beasts;” Francis Gummere translates it as “whales;” and C.L. Wrenn offers “whale.” So it sounds like there’s agreement across the board. But why append “fixas” to the word for whale? Well, if you guess “for alliteration” you would be sort of right. So another alliterative pair stands between it and its alliterating brethren. It’s safe, then, I think, to say that “hron-fixas” isn’t there to add music to the poetry of Beowulf’s speech. Maybe, then, the dictionary will have some answers. Looking at the definition of “fixas” in Clark Hall and Meritt only yields up “fish” (after pointing us to “fisc”). So that doesn’t really tell us much about why the poet didn’t just use “hron” either. What other sort of “fish” were the Anglo-Saxons writing about? But that brings up a good point. Especially with “mere-fixas,” both of these compounds are redundant. That is, “hron-fixas” and “mere-fixas,” combine words that are so alike that they easily reduce into one word when translated. But why compound them in the first place? Well, since both involve “fixas,” which we’ve already established means “fish,” maybe it’s to emphasize their being in the sea. These aren’t land or sky beasts or brutes – they’re “sea-beasts” and “sea-brutes.” At least according to Seamus Heaney. But, then why does Beowulf even bother calling these beasts “whales”? My guess is that “whale” was just the Anglo-Saxon word for any enormous sea creature, whether it was actually what we know today as a whale or something else entirely (a giant squid or now extinct dinosaur-like creature). Some have theorized, based on x-rays, that whales carry vestigial legs. It’s possible (though unlikely?) that the whales that Beowulf fought still had these legs and they were recognizable as legs. If that’s the case, then maybe these legs lead the Anglo-Saxons to seeing them as the sea’s guardians just as dragons were the guardians of caves and hoards. Of course, because we don’t have Anglo-Saxons to pull aside and ask just what was meant by “hron-fixas” specifically, we may never know exactly what Beowulf means when he uses the word. It could, after all, just be a general word for a general application that the poet felt was the best fit. It should also be said that two men swimming in stormy waters aren’t likely to get a good look at such creatures. That they were swimming armed suggests that they weren’t worried about getting a good look, either. 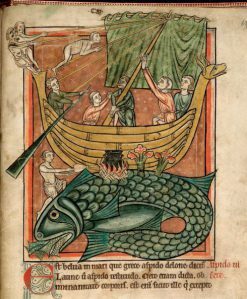 How do you understand Beowulf’s use of “whale” and “sea-fishes”? Do you think he’s referring to things that we would refer to with these words, or some other class of animal entirely? Next week, the action continues as Beowulf recounts his bout with one of these mysterious sea creatures. A young man makes a mead hall stand. Beowulf presents his counter argument to Unferth’s accusations of weakness and introduces his version of what really happened with Breca. hardship on the waves, than any other man. Well, if Beowulf is to be believed, Unferth is in his cups at this point. But Beowulf? If he’s been drinking, then drink may well make him more eloquent. Immediately after Unferth’s saying that Beowulf is not as great as he’s said he is, the main man himself throws down his rebuttal. Ever aware of the order of things, though, Beowulf doesn’t just reply with a quick “That’s not true!” (or the even simpler “nuh-uh!”). Instead we get a very structured, very well laid out rebuttal of what one of Hrothgar’s closest thanes had to say about Beowulf. 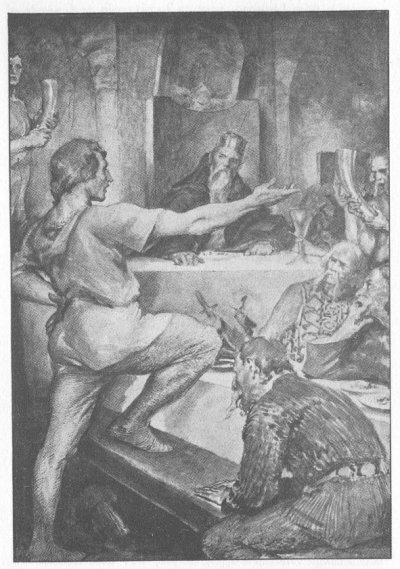 First in Beowulf’s reply we hear what Unferth did in the subtext of his accusation: Beowulf attacks Unferth’s character. Of course, being Beowulf, he does so up front and boldly. Making the jab that Unferth’s not doing the talking, but the beer is if he’s going to say that sort of thing about Breca. I like to think that Beowulf paused for laughter then, if only that of his own men (while Hrothgar, or maybe some of his other thanes, groaned). Then Beowulf presses onward to “The truth as I reckon” (“Soð ic talige” (l.532)). He admits that making such a bet is reckless, but also that that was just the nature of his friendship with Breca. It’s not direct, but I read this as Beowulf’s reply to Unferth’s implication that the swimming challenge was something off the cuff or coming from a drunken mind. What’s more, Beowulf reflects that he and Breca were yet young then, and so the foolishness of the boast should be definitely be set aside. Now, whether the poem’s audience or the audience in the poem (or both) would find this funny is up for debate. But, at this point in the poem, Beowulf can’t be older than 20. So, though he may well have been younger when he and Breca braved the waves in this foolish bet, he isn’t now that much older. Whatever sort of verbal tricks and public speaking strategies Beowulf might have used up to the end of this week’s extract, its final sentence really shows his acumen as a story teller. Or, at the least, it shows the poet’s desire to have his subject appear to be expert in this essential skill. Compelling storytelling would be essential even for warriors, though, since if you couldn’t tell a great story (or had such a teller with you always), how would your deeds be immortalized in the memories of men, women, and children? Whatever the case, Beowulf’s saying that he and Breca bet that they would risk their lives on the “spear-sea” (“gar-secg” (l.537)) – not even just the “secg” but the dangerous-sounding “gar-secg” – and that things turned out that way too is the perfect end point for an introduction. It’s like the hook you’d find at the end of a book’s prologue or first chapter. It’s also important that Beowulf make this predictive statement since it suggests that circumstances would see the boast fulfilled. He’s just boasted about beating Grendel (god willing), so making good on a boast about racing in the sea would help boost his hosts’ confidence in him. Such a statement reinforces the idea that Beowulf is able to turn his words into deeds. Do you think that Beowulf’s really putting this much thought into his reply to Unferth? Or is he just opening his mouth and talking? I don’t think any Anglo-Saxon would have sucked on the blade of grass he had in his mouth, thumbed his overalls, rocked on his heels and said “Well. I reckon…” But Beowulf pretty much does just that before he tells Unferth and whomever else is listening his version of the Breca event. Nonetheless, the word he uses in his “The truth as I reckon” (“Soð ic talige” (l.532)) is “talian,” (the root of the modern “tally”) a word that can also mean “count,” “calculate,” “account,” “relate,” or “impute.” Among these options, I went with “reckon” because I think that even in Old English this understanding of “talian” connotes clear, sober thinking. Unferth may have been drinking well before the Geats arrived, but Beowulf’s maybe had a mug or two. So I think “reckon” suits when it comes to describing his present thinking. Looked at apart, though, we get a pretty clear suggestion that such skill, such strength, comes only in “manhood,” or “mature years.” The implication that I pull out of that being that you can only achieve that level of strength after practicing something into your “mature years.” Actually, if that’s the case then translating “geogoð-feore” of four lines down as “youth” seems inaccurate. As a combination of the word for “youth” (“geogoð,” which even sounds sort of like the Modern English word since its vowel-ensconced “g”s are pronounced as “y”s) and the word for “life, principle of life, soul, spirit” (“feore”) a literal translation of this compound could be “youthful in spirit”. What do you think is more important when it comes to translation? Is it better to go with the rough equivalent of a word in Modern English even if it simplifies the Old English original, or should a translation err on the side of being literal as much as possible? Next week, Beowulf details the dangers the two faced, their strength in the race, and what befell them on the sixth night.